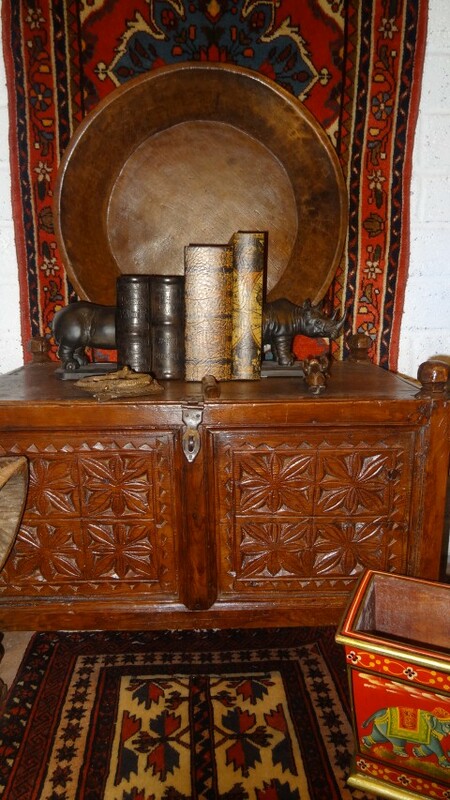 Swati chest traditionally used for storing clothes. Lid opens from the top. Dimensions Depth 17″ (43 cms) Width 28.5″ (71cms) Height 21.5″ (55cms). Price £ 225 Small planter with painted elephant Price £32. Small Baluchi carpet (on the floor). Persian carpet runner on the wall. Wood bowl from Swat valley. Rhino book ends and book boxes.